If Peabody's coal sales can't even pay the bills, how is it going to pay down its $6 billion in debt? 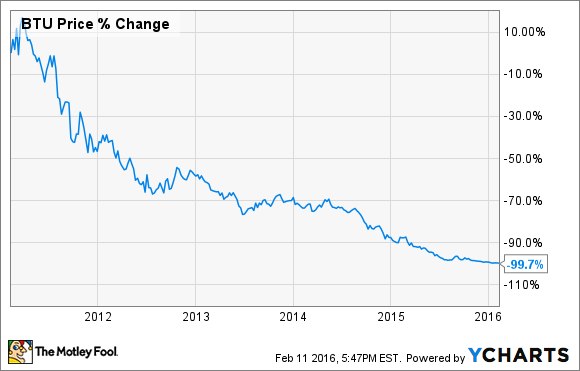 2015 was not kind to Peabody Energy (NYSE:BTU). Then again, the last time the market was kind to Peabody was back in 2010. Since then the company's stock price has been on the steady decline as a myriad of forces have pushed down the worlds appetite for coal. As much as some may be temped to say that we are at the bottom and things can't get much worse from here, Peabody's fourth quarter earnings paint a different picture. Let's take a look at Peabody's numbers for the quarters and why the company won't be around much longer if these kinds of earnings results persist for much longer. One might say that Peabody is doing what it can to try to stay afloat in this brutal coal market, but the cut in operating costs and the almost elimination of capital expenditures still hasn't been enough to cover the decline in prices and the lower production volumes that have eaten into revenue. Based on the prices Peabody earned on its coal this past quarter, the company only generated a gross profit of about $4.75 per ton of coal, and some of its operations such as its metallurgical coal in Australia is being sold for less than what it can be extracted from the ground. Here's a quick breakdown of the company's operations by business segment, but keep in mind that this is before non-mining related expenses such as hedging and corporate expenses. Probably the entire situation at Peabody can be best described as this. The company's current operations aren't even generating enough operational cash to make interest payments on its existing debt, so the company is pulling on all the financial levers it has to maintain some level of liquidity and hopefully pay down some of the $6.2 billion in debt on the books. That is why the company has elected to draw the remaining portion of its $1.6 billion credit facility. Basically, it thinks its can use that cash to see its way through the market until a recovery comes. Here's the issue, though. After drawing the remaining of that credit line, the company has about $902 million in cash and liquid assets. In 2015, the company's interest expenses alone were $465 million, and that is before the company's operational losses. Even if the company were to see a modest uptick in prices, chances are it will still be burning through a big chunk of cash throughout the year. With no room left on its credit line, it's very likely that the company has pulled every financial lever it can. The company can keep cutting costs and shutting down un-economical mines, but the company's results say that the only thing that will drag the company out of this is an increase in prices. Unfortunately, there aren't a whole lot of signs that higher prices are in the cards. According to the most recent outlook from Alliance Resource Partners (NASDAQ:ARLP) CEO Joseph Craft, the company expects coal volumes and price realizations across the US to decline even more than what we have seen last year. The reason for Craft's sour outlook is that we have been experiencing a warmer than usual winter, which lowers overall electricity demand, and cheap natural gas continues to take market share from coal. Peabody has a decent portion of its coal already sold on pre-negotiated contracts, but most of those put its sales price at just a few pennies above what we saw this past quarter. Furthermore, The company expects to produce about 18-28 million tons less in the coming year. This means that the remaining coal not sold on pre-negotiated contracts will need to be sold at a price high enough that it can cover the already persistent cash shortfall. Right now, it's awfully difficult to see that happening. The decline of Peabody Energy is a textbook example of why investors shouldn't simply look at a share price plummet and say "it can't get any worse than it has already." Investors have been saying that for 3-4 years looking at Peabody's stock, and yet each time it has gotten worse. With that giant debt albatross hanging around its neck, Peabody needs some sort of help from the coal market to have any chance of staving off becoming insolvent, but it doesn't look like its going to happen any time soon. If we see another quarter or two of results like this, chances are this 130 year old company wont make it much longer.